Moving to Mexico in October 2008 I was ecstatic about the gardening possibilities in a tropical zone. I love gardening, and especially love flowers. The entrance courtyard was perfect for a grouping of large terracotta pots that could hold a profusion of flowering plants. The ocean-side of the house had unlimited possibilities for a garden either in pots around the patio, or perhaps a few set into the beach area. We also have two upper decks that would look stunning with terracotta pots overflowing with brilliantly coloured flowers. I could hardly wait to get started. 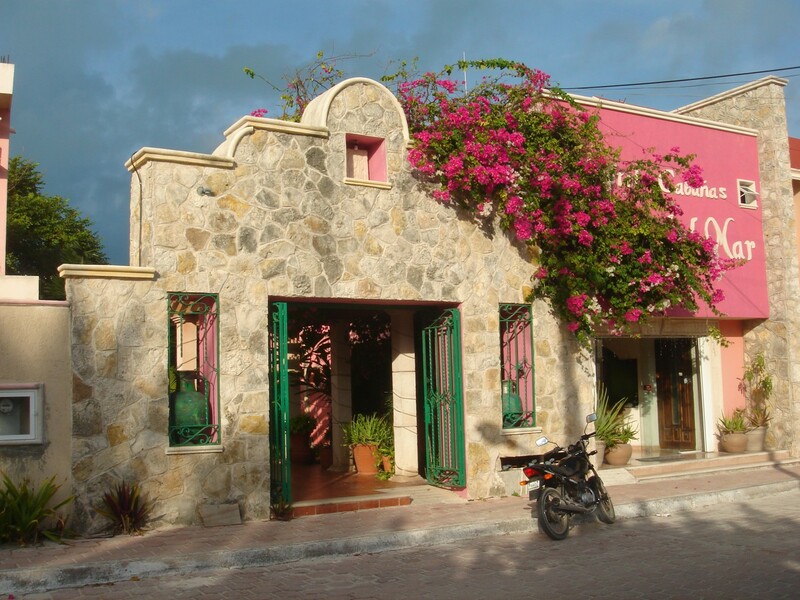 The first plants that we bought were eight raspberry red Bougainvillea; that ever-present thorny vine that climbs and clamours over houses, hotels, restaurants, and fences everywhere in Mexico. Four vines went into the planter in the carport, and four more into a planter in the courtyard. I had thought to mix in a variety of colours, such as strawberry pink, flame orange and snow white, but decided to stick with one colour and build the colour palette with other types of flowering plants. The plants responded beautifully to their new home, quickly sending up four and five foot long shoots into the air, grasping for things to climb. And then the cooling winter winds started! Disaster! 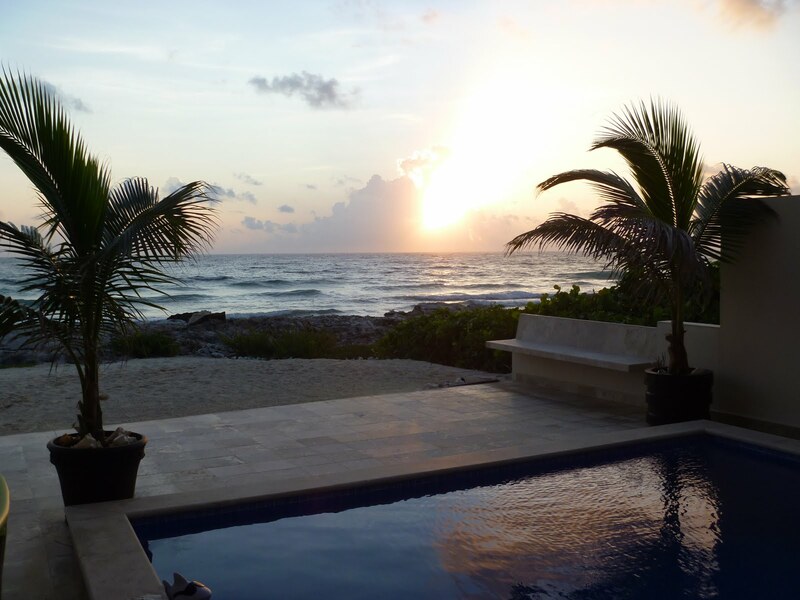 It turns out that the cool winds that enticed us to build our oceanfront casa on the windward side of Isla Mujeres are hell on gardens. Even though the temperature seldom drops below 20 degrees C (about 68 degrees F) tropical plants are a wussy lot, turning brown and dying back at the slighted dip in temperature, and especially when a cool salty wind blows across their leaves. Even the tough invasive plants such as the Moon Vine, a white-flowered, night blooming and very fast growing relative of the Morning Glory, turn black and wither into the ground waiting for the arrival of warmer weather in April or May. Sissies, they have no idea of what cold really is! But I was not to be deterred! I will overcome this minor setback. 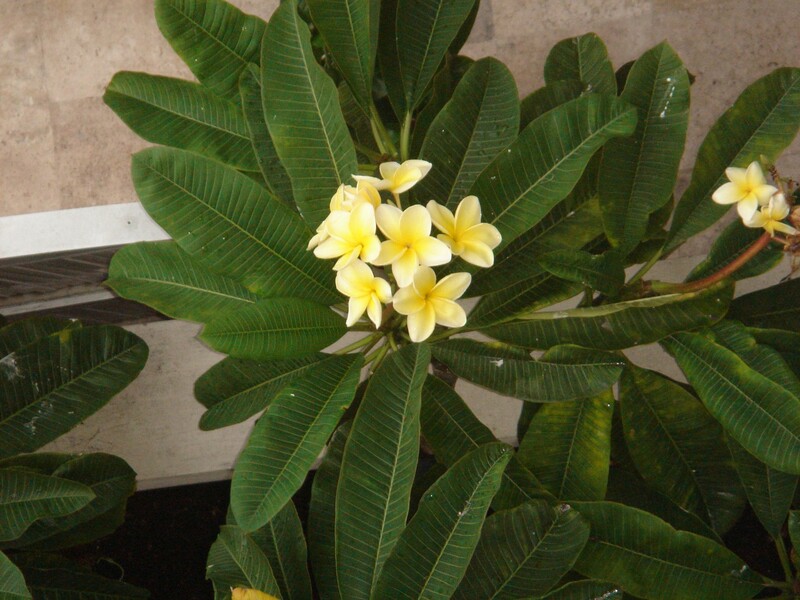 Out came the Bougainvillea, and in went a Flores de Mayo (Flowers of May otherwise known as a Plumeria). It did fine, offering a profusion of yellow-orange flowers, until the winds started. At that point every leaf on the plant dropped and we were left with a stark-naked plant to grace our carport entrance for the next six months. I have also tried Gardenias in pots along the outside wall of the courtyard with their heavenly scent perfuming the air, causing passersby to comment on the delightful smell. Died! They hated the winds in the winter, and hated the intense heat of the summers. Then there was the month of Geraniums – cheerily displaying their blooms from various terracotta pots. Ditto the above results. At some point I even tried purple Chrysanthemums thinking them tough enough to at least survive the cool winters. Nope! The salty winds killed them as well. 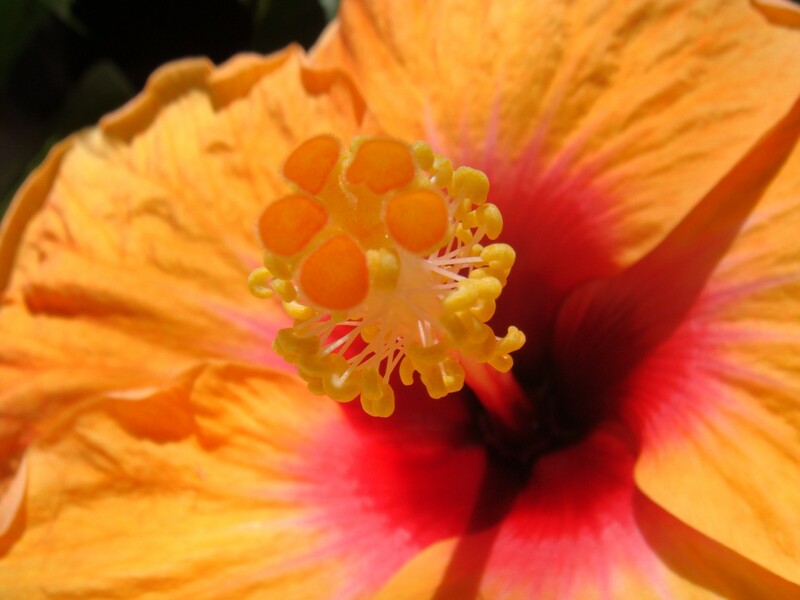 Finally – Hibiscus thrived on my upper street-side deck, tucked away from the winds. We have had months and months of delightful eight-inch vibrant orange blooms with a deep red centre. Stunning! Until August arrived – nearly killing the plants with the intense afternoon heat. Rats! We moved both pots out to the ocean-side of the house, playing a dangerous game of waiting until the heat abates on the west side, hoping to move them back before the breezes intensify on the east side of the house. So what does thrive on an ocean-front lot? Coconut palms. We now have five pots of coconut palms on the patio. The upper deck has two recuperating Hibiscuses, and one presently healthy Rosemary plant. The courtyard currently has one palm, an assortment of citrus trees that I am experimenting with, a large pot of orange Canna Lilies, and another pot holding a yellow Hibiscus. So far so good. Not exactly the Gardens of Babylon but it’s a place for small lizards, geckos, beach dogs, and cats to lounge. It’s still paradise for us, with or without the Bougainvillea. Your view makes up for any lack of flowers and the palms are so beautiful.